Beginning in the 1990’s, substantial advances have been made in the ability to image the living human brain. Functional MRI, PET, and other modalities have been developed to provide a rich means for assessing brain function and structure across spatial and temporal dimensions. Such methods are now the preferred means to examine the brain in vivo, with several thousand articles now appearing in the literature each year. The next era of human brain imaging is upon us now as technological developments reach a level where data can be processed quickly and combined with other biological information to provide fundamentally new applications and insights. This new era will involve and require the collaborative participation of leading research groups from around the world to share information and expertise for understanding observed effects and synthesizing these into new knowledge. One particular community that is gaining in its prominence in the field is that of the Pacific Rim, whose collective research efforts present an important corpus of research effort into brain structure and function. The Pacific Rim represents an important community of researchers interested in the greater sharing of ideas. 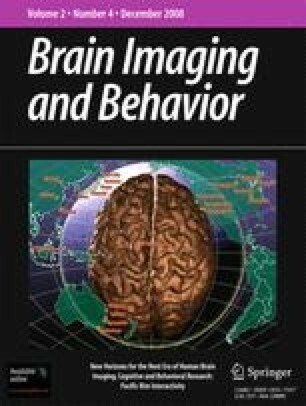 In this special issue of Brain Imaging and Behavior, we focus on emerging areas of research that utilize brain imaging methodology, and discuss how current developments are driving the expansion of functional imaging research. Moreover, we focus on the robust interaction of researchers from around the Pacific Rim whose collaborations are significantly shaping the future of brain imaging. The special issue editors wish to recognize the support of the International Brain Research Organization (IBRO), University of California Pacific Rim Institute, the National Center for Research Resources (NCRR), and the International Society for Magnetic Resonance in Medicine (ISMRM), The Institute for Collaborative Biotechnology (ICB) at UC Santa Barbara, The International Neuroinformatics Coordinating Facility (INCF), and Sun Microsystems. We also would like to thanks Ms. Amanda Hammond and Mr. Vaughan Greer of the Laboratory of Neuroimaging (LONI) for their efforts with preparing cover artwork. Finally, we extend our thanks to the Editor-in-Chief of Brain Imaging and Behavior, Professor Andrew Saykin, for his encouragement and enthusiasm for this special issue.